As you can see in the title, “onigiri” means Japanese rice balls. It may sound too simple, but it’ not. We of course have very simple onigiri made only with rice and some salt. However, we have a wider variety of onigiri, too! I found a great how-to video for making onigiri, with English guidance. A Japanese woman and a dog show you how to make various kinds of onigiri on this video. Check it out! 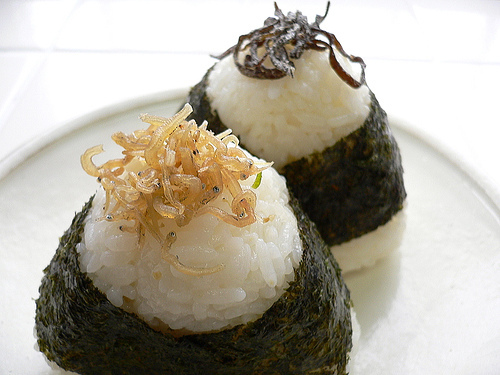 **Molding rice when it is still warm makes it easy to form onigiri into the desired shape. I’m quite sure that some of the ingredients may be difficult to get outside of Japan. So, let me tell you the substitutes^^. *Pickled Hiroshimana >> Any other pickled vegetables by salt or soy sauce (not vinegar) are fine. And Korean kimchee may be good as well! *Wasabi >> Regular white or black pepper is fine. *Shiso Leaf and Kinome >> These are used as toppings, so not necessary.